. . . and works of art in their own right. What model is that green porsche? Assuming it's a porsche because of the badge... never seen it before. And the rims on the car on this page are jsut insane! Andy is correct; it's a 906. Not sure of its provenance, but it seems to be an early car since it lacks the front splitters. 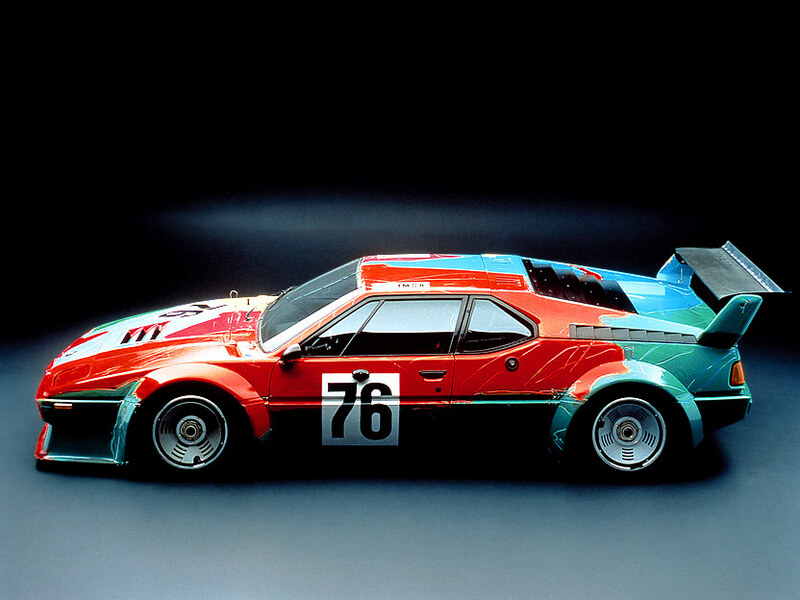 The car on this page is an inline six cylinder, BMW M1 that was painted by Andy Warhol. The car raced at LeMans in 1979 and came in second in class. That was its only race, supposedly. Last edited by Mark in Baltimore; 10-28-2007 at 11:54 AM. Reason: Changed "last race" to "only race". "PUT THAT COFFEE DOWN! Coffee is for closers." "You got leads. Mitch & Murray paid good money. Get their names to sell them. You can't close the leads you're given, you can't close ****, YOU ARE ****, hit the bricks pal, and beat it, 'cause you are going out." "The leads are weak? The ****ing leads are weak? You're weak! I've been in this business fifteen years..."
"**** you! That's my name. You know why, mister? 'Cause you drove a Hyundai to get here tonight, I drove an eighty thousand dollar BMW. That's my name. "Your name is "you're wanting", and you can't play the man's game, you can't close them, and then tell your wife your troubles. 'Cause only one thing counts in this world: get them to sign on the line which is dotted. You hear me you ****in' *******?! " "Who are you? What's your name? "You see this watch? You see this watch? "That watch costs more than your car. I made $970,000 last year. How much you make? You see pal, that's who I am, and you're nothing. Nice guy, I don't give a ****. Good father, **** you! Go home and play with your kids! You wanna work here, close! You think this is abuse? You think this is abuse, you **********? You can't take this, how can you take the abuse you get on a sit?" "A-I-D-A. Attention, Interest, Decision, Action. Attention - Do I have your attention? Interest - Are you interested? I know you are, because it's **** or walk. You close or you hit the bricks. Decision - Have you made your decision for Christ? And Action. A-I-D-A. Get out there - you got the prospects coming in. You think they came in to get out of the rain? A guy don't walk on the lot lest he wants to buy. They're sitting out there waiting to give you their money. Are you gonna take it? Are you man enough to take it?" "We're adding a little something to this month's sales contest. As you all know, first prize is a Cadillac Eldorado. Anybody want to see second prize? [Holds up prize] Second prize is a set of steak knives. Third prize is you're fired." It's inspirational I tell you. OK, I'm done, please disregard. I'm turning 40 on Wednesday. I wish I could disregard that. Oh, and I get to spend the week in South Dakota! Everyone's birthday wish. Born in Sioux Falls, SD. Or as some people say SueEx Falls. SD isn't that bad...to visit!! Phesants, moral mushrooms, and some damn good Walleye! I lived in Huron, SD for four years when I was a kid. Just went back there two weeks ago (unfortunately, for a funeral). The Black Hills are beautiful. As for the rest of the state.....not a lot there to float my boat. I agree, the 906 is the best looking car I've ever seen! 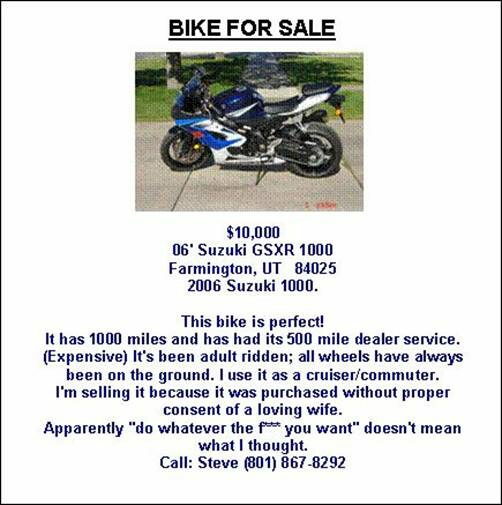 Please disregard...one of the few honest for sale ads I've seen. I did the same thing after getting a near identical response from my wife when I wanted to buy my bike as she was in her 8th month of pregnancy with our 2nd. Luckily, she came around, and I still have it.